Dear ones, welcome to another silent Sunday ..... and yes, I have been silent most of the other days of the week as well. This too shall pass, and the creative muse and comforts of routine will return. In the meantime, I remain closely connected to dear ones from northern climates who continue to endure what meteorologists claim is the harshest winter in 40 years. Science has taught us that during these long seasons of extreme temperatures and longer hours of darkness, our chemistry is deprived of the kind of light that triggers seretonin production in the brain - the 'feel good' hormone. The condition is known as S.A.D. and stands for Seasonal Affective Disorder - ie. the winter blues. Help is on the way! In a week's time, our clocks will spring forward by an hour again, and thus the transformation will begin. 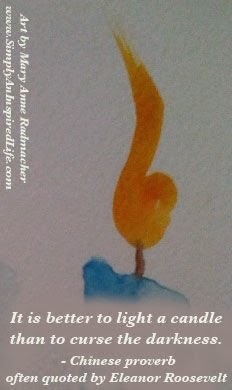 In the meantime, let us all light a candle as a symbol of being able to 'see the light' in ourselves and in others. May we offer up gentle thoughts in place of agitation and overreactions. May love and light replace fear and darkness. Namaste today and always. Winter is a swear word at this point. As I gave up swearing for Lent, I will not utter the word again. Think Spring! Thank you, dear one, for this most important reminder. Namaste and great light to you!